Actor Who Said "I'll Make Him an Offer He Can't Refuse"
You would probably say that Marlon Brando was the actor who said, "I'll make him an offer he can't refuse." He played the character Don Vito Corleone in the movie The Godfather, directed by Francis Ford Coppola. Mario Puzo wrote both the book, published in 1966, and the film, produced in 1972. The famous quote appears in both and also in both sequels, The Godfather: Part II and The Godfather: Part III. However, the line spoken by Don Vito Corleone is just a bit different. He says, "I'm gonna make him an offer he can't refuse." It's actually Al Pacino, playing Vito's son Michael Corleone, who said, "I'll make him an offer he can't refuse." There's a subtle difference in the two lines that has been forgotten over time, although the meaning is basically the same. 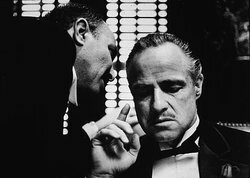 Marlon Brando's line occurs when Vito Corleone's godson Johnny Fontane, played by Al Martino, asks his godfather for a favor. Fontane wants to become a film actor and needs Corleone's help to secure the role, since he has already been turned down for it by the producer. After Fontane comes crying to his godfather, literally, Corleone tells his godson, "I'm gonna make him an offer he can't refuse." Later, the film cuts to a very memorable scene in the film producer's bedroom, where he wakes up next to the head of his own racehorse. No surprise, Fontane gets the part and becomes a movie star. Al Pacino's line occurs after Michael takes over the family business. Another mobster, Moe Greene, has refused the family's offer to buy his casino. Michael predicts he will change his mind, saying, "I'll make him an offer he can't refuse." Again, no surprise, Greene is soon dead and the Corleone family owns his casino. An offer may seem like a negotiation; however, the offer in "I'll make him an offer he can't refuse" really isn't a gift or an exchange of services but a death threat, which is why "he can't refuse." Since mobsters are not known for negotiating, this line comes in handy many times throughout The Godfather trilogy in idea or words. For example, Al Pacino, as new head of the family Michael Corleone, says this line when referring to Moe Greene, another mobster, selling his shares of a casino in Nevada that the Corleone family wants in The Godfather: Part II. Film critics and historians have speculated that Fontane's character was based on the dealings of legendary film star and singer Frank Sinatra. While Sinatra was often seen in pictures with mobsters and reported by others as being friendly with them throughout his life and career, he has always denied that this scene was based on him or his actions and has denied his involvement with any mobsters. Be sure to check out more Marlon Brando quotes! "Actor Who Said \"I\'ll Make Him an Offer He Can\'t Refuse\"." YourDictionary, n.d. Web. 20 April 2019. <https://quotes.yourdictionary.com/articles/actor-who-said-i-ll-make-him-an-offer-he-can-t-refuse.html>. You would probably say that Marlon Brando was the actor who said, “I’ll make him an offer he can’t refuse.” He played the character Don Vito Corleone in the movie The Godfather, directed by Francis Ford Coppola. Mario Puzo wrote both the book, published in 1966, and the film, produced in 1972. The famous quote appears in both and also in both sequels, The Godfather: Part II and The Godfather: Part III.However, the line spoken by Don Vito Corleone is just a bit different. He says, "I'm gonna make him an offer he can't refuse." It's actually Al Pacino, playing Vito's son Michael Corleone, who said, "I'll make him an offer he can't refuse." There's a subtle difference in the two lines that has been forgotten over time, although the meaning is basically the same.